Are you struggling with your ever-increasing body weight and want to find an effective and sustainable way to lose weight? Then include more fresh salads in your daily diet instead of following fad diets. Starting to eat a wholesome salad at least once a day can bring about noticeable difference in your body and help you to achieve your target weight. The benefits of salads can be attributed to its content of fibrous carbohydrates that are present in the leafy greens, vegetables, beans, legumes and grains. All these ingredients form the low-calorie and filling base of a salad. The nuts, plant oils, cheese, eggs, chicken and lean cuts of red meat that are added to the salads provide healthy fats and high-quality proteins to the body and turns it into a power-meal. 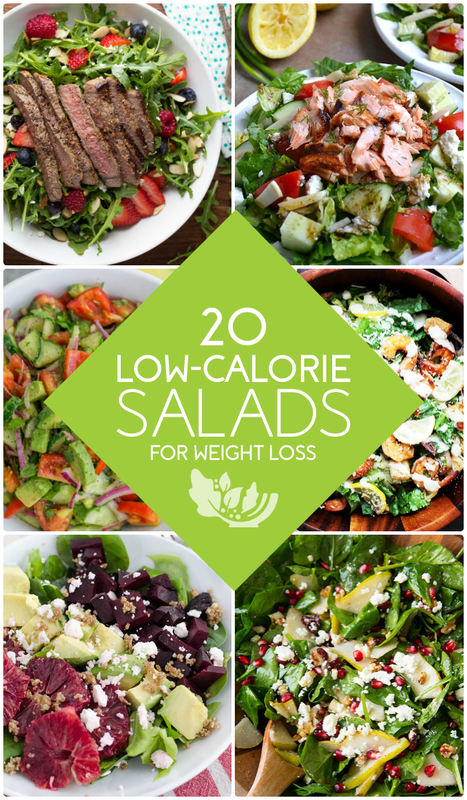 In this article, we have listed 20 of the healthiest low-calorie salad recipes that you can include your weight loss diet. Increases fiber intake – One of the biggest benefits of replacing regular meals with fresh salads is that it helps to increase the intake of dietary fiber (both soluble and insoluble fiber). The leafy greens such as kale, spinach, lettuce, arugula, etc are packed with fiber that helps to reduce the waist line. Fibers increase satiety and keep you feeling fuller for longer. It lowers cholesterol levels and prevents constipation. Reduce Calorie intake – Salads made with fresh leafy greens, non-starchy vegetables, fruits, nuts and light dressings are low in calories and carbohydrates. The high fiber content in salads increases satiety, so if you begin your meal with a plate of salad then you eat less of the high-calorie, high-carb and fatty foods during the following courses. Get more vegetables in your diet – Nutritionists and physicians recommend the intake of 3 to 5 servings of fruits and vegetables every day for healthy functioning of the body. But most of us fail to get out daily dose of fruits and veggies due to our busy schedules. But having a salad at least once a day allows you to enjoy a mix and match of fruits and vegetables in just one bowl. Source of healthy fats – The healthy salad dressings such as olive oil, sunflower oil, avocados, nut vinaigrette, nuts and seeds not only enhances the taste and flavors of the salad but also work as potent sources of healthy fats that improve nutrient absorption from foods, increase satiety and aid weight loss. This green salad is ideal for vegans and vegetarians who don’t get enough of protein from their foods. Tofu is one of the best plant-based sources of high-quality protein that makes this salad absolutely filling. 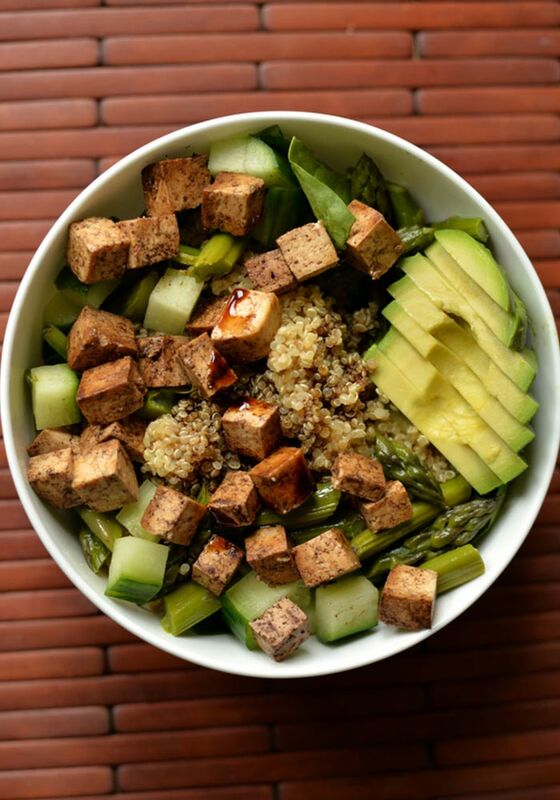 The combination of leafy greens, quinoa and avocado along with the tofu makes is a perfectly balanced salad that can be enjoyed for lunch or dinner. Skinny Perks – The high-quality soy proteins found in tofu fuels the muscles which helps you to burn fat at a faster pace and helps to improve body composition. It is extremely low in calories and carbohydrates that also aids in calorie burn by filling you up without adding too many calories. This healthy and delicious low carb tuna salad makes the perfect side dish for meals that can be enjoyed with crisp toast or with quinoa or brown rice. The vegetables give a nice crunchy texture to the salad while the tuna adds some chewiness to it. The combination of appealing flavors makes it all the more appetizing. You can enjoy it at home or pack it for lunch on busy workdays. Skinny Perks – Tuna is a potent source of protein and omega-3 fatty acids, specifically docosahexaenoic acid (DHA) that is extremely beneficial for weight loss and blasting stubborn belly fat. Research shows that DHA has the ability to turn off abdominal fat genes, thereby preventing belly fat cells from expanding in size. The proteins and carbs present in tuna helps to increase satiety at the expense of very few calories. 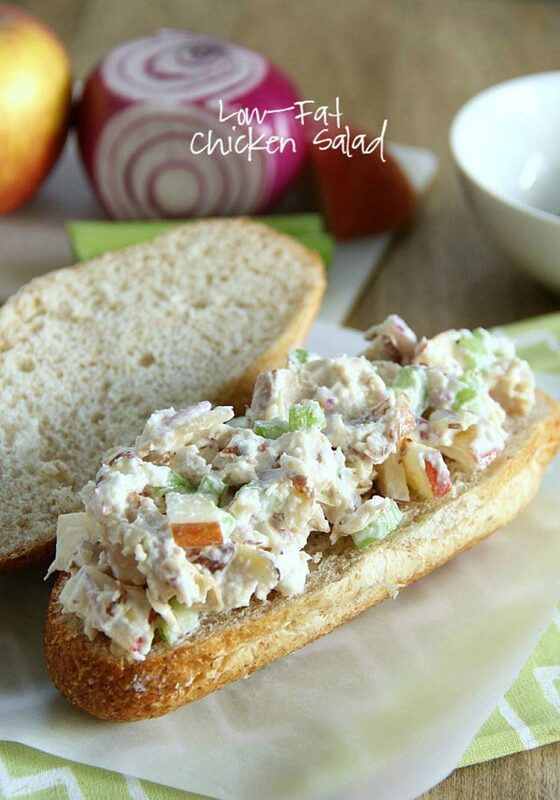 This low-fat chicken salad containing no mayonnaise, cheese or oil is one of the best foods for weight watchers. The high-quality proteins and fiber present in this salad makes it absolutely filling and wholesome and helps you to stay full till the next meal. The delicious Greek yogurt dressing enhances the taste of the salad without compromising on the calories and fat. Skinny Perks – Chicken breast is considered one of the most effective foods for weight loss and muscle building because it is packed with low-calorie proteins. The lean proteins found in chicken boosts satiety and promote the body energy expenditure so that your body burns extra calories even at rest. It has a positive effect on body composition as well. Protein decreases total body fat and abdominal fat and increase lean body mass. 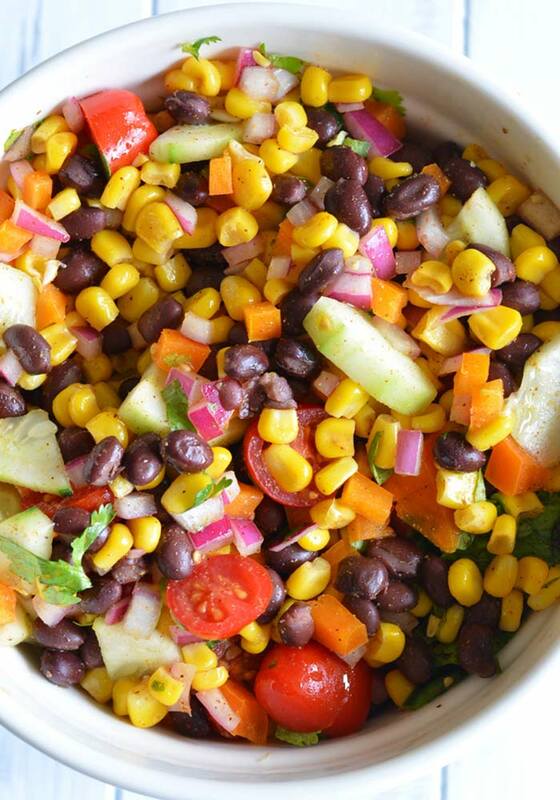 This colorful corn and black bean salad not only looks beautiful, but also packs in a lot of flavors, texture and nutrients that makes it an amazing recipe for breakfast. The beans and corn form a nice chewy base and pack in some complex carbohydrates, fiber and protein, while the tomatoes, bell pepper, cucumber and spices enhances the flavors and savory-tangy taste of the salad. The lemon juice adds a refreshing touch to it. Skinny Perks – Black beans are considered nature’s health food for weight loss which is packed with proteins and fiber. Both fiber and protein increases satiety and helps to keep you energized for hours. The soluble fibers present in black beans lower the level of harmful LDL cholesterol in blood. Soluble and insoluble fibers also help to maintain the healthy functioning of your digestive system and aid regular bowel movement which is also beneficial for weight loss. This healthy and filling Chickpeas salad takes just 10 minutes to prepare but it makes a perfect dinner side dish that is flavorful, delicious and low-calorie. It makes use of minimal oil and spices which makes it absolutely light. The chickpeas pack in powerful protein and fiber punch while the vegetables add a nice layer of texture to the salad. The herb-citrus vinaigrette renders a refreshing and enticing aroma and appetizing tangy-savory taste to it. Skinny Perks – Chickpeas supply a low-fat boost of nutrition that supports healthy weight loss. The fibers in chickpeas also help you to lose weight by increasing satiety. It is exceptionally low in calories which also make it a perfect weight-loss food. The soluble fibers in chickpeas absorb water and swell up in the intestine to fill it up. This in turn, sends a signal to the brain that it is satiated. 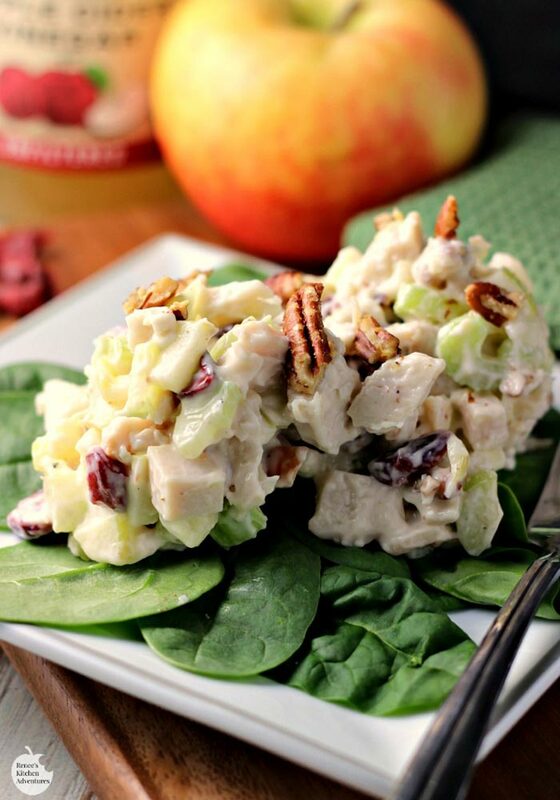 Indulge in the delightful taste of this wholesome turkey salad with apples, cranberries and pecan and make the most out of its amazing health benefits. The mixture of pecans, cranberries and apples render a nice crunchy and chewy texture to the salad along with a range of sweet, savory and tangy tastes. Just serve it on leafy greens such as spinach or lettuce or as a sandwich and your meal is ready. It is healthy way to use up any leftover turkey. Skinny Perks – Just like chicken, turkey is also a low calorie source of lean protein which makes it a super-food for weight loss. Quarter pound of turkey provides 16 grams of proteins at the expense of 140 calories. The protein boosts up metabolism and calorie burn and helps to replace body fat with lean muscle mass. This wholesome and filling steak, berry and arugula salad with packed with the goodness of antioxidants, proteins, fiber and healthy fats. It takes just half-an-hour to prepare but makes for an elaborate week-night meal that can be served for lunch or dinner. The balsamic vinaigrette seasoning enhances the flavors and taste of the salad and makes it all the more appetizing. Skinny Perks – Grass-fed beef steak is an amazing source of lean protein that helps to speed up body metabolism and promote the formation of lean muscle mass. Increased muscle mass help to replace fat with muscles so that you can have a toned and shapely body. Leaner cuts of steak are considerably low in calories; a 4 oz strip steak contains only 133 calories and 26 grams of protein. 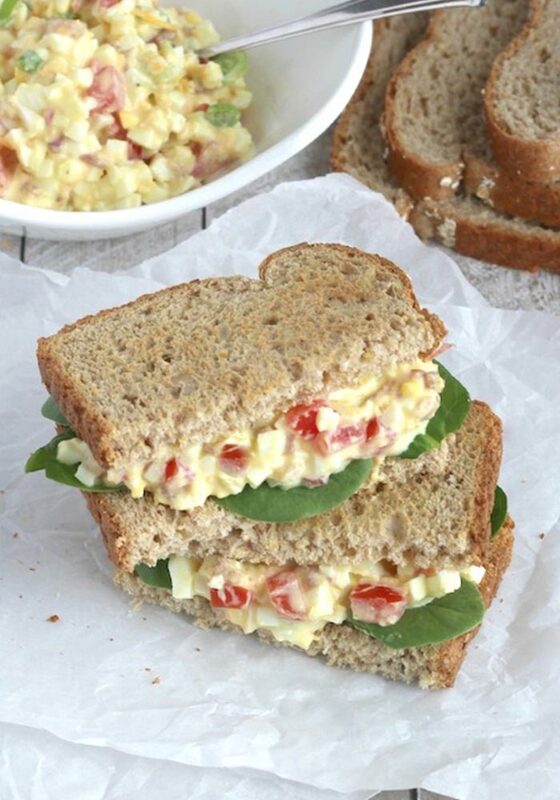 This wholesome and hearty egg salad is a makes a delicious filling for sandwiches or lettuce wraps that can be enjoyed as a healthy snack or served as an appetizer before the main course. The Greek yogurt and cheddar cheese seasoning combines with the mustard and vinegar and perfectly covers the hard-boiled eggs and render a mouth-watering plethora of savory-tangy flavors to it. The bacon adds a nice crunchy and chewy texture to it. Skinny Perks – Eggs are one of the cheapest and readily available sources of high-quality protein and amino acids. The proteins help you to stay full while the amino acids boosts metabolism. Eggs rank high on satiety index scale which means it helps you to stay satiated for a longer time and reduce the propensity to snack between meals. This is a healthier version of the creamy classic Caesar salad that does not make use of egg yolks in the dressing. The delicious crunchy and rich shrimp Caesar salad combined with juicy grilled shrimps and flavorful garlic croutons make a wholesome and delicious lunch or dinner. The savory and tangy salad dressing adds some enticing aromas to the dish that can be enjoyed by the whole family. Skinny Perks – Shrimps are packed with protein and contain very few calories which make it a perfect weight loss food. One ounce of shrimps provides 6 grams of protein at the expense of 30 calories and minimal fat. Shrimps are a rich source of mineral selenium which is used by the body for regulating thyroid functions. Healthy functioning of the thyroid gland aids in weight management by controlling the release of hormones that affect how fat is used in the body. 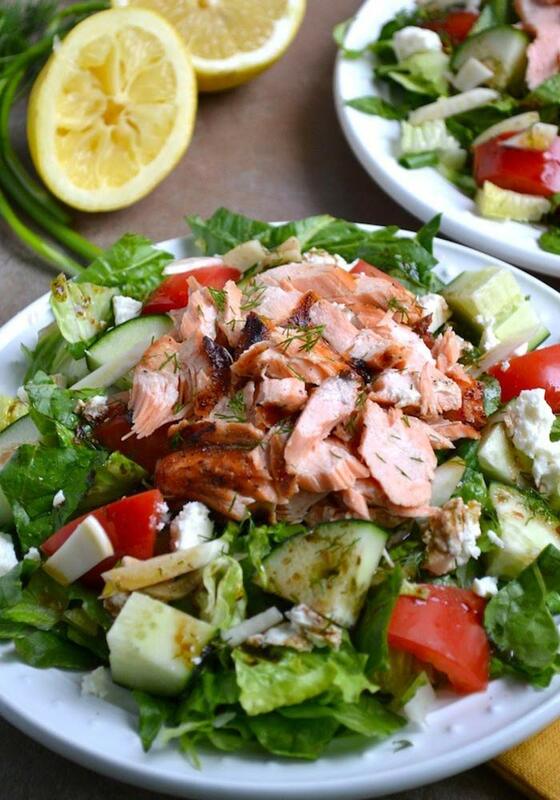 This refreshing, flavorful and healthy Greek salmon salad is a great way to satiate your cravings for savory and rich foods without compromising your health. The mixture of salmon, tomatoes, cucumber and cheese creates a layer of chewy and creamy textures and appetizing flavors. The savory and flavorful dressing enhances the taste and aroma of the salad. Skinny Perks – Although salmon is relatively high in calories and fat compared to other cold water fish, but studies show that the oil contained in salmon aid in weight loss by boosting metabolism. A 3 ounce serving of salmon provides 22 grams of protein at the expense of 155 calories and 7 grams of fat. Salmon is a rich source of lean protein that helps you to stay full for longer period of time. Not a big fan of broccoli? This delicious and crunchy Best Ever Broccoli Salad bursting with flavors will definitely change you view. Packed with the goodness of broccoli along with tangy grapes, crunchy almonds and yummy bacon – this is one wholesome salad that makes a complete meal. The combination of mayonnaise and red wine vinegar creates a wonderful dressing that enhances the flavors and taste of the salad. Skinny Perks – The high fiber content in broccoli helps to keep you satiated and controls hunger which helps you to eat less and burn more calories. A one cup serving of broccoli is packed with vitamin C and K and it contains just 40 calories. Vitamin C promotes oxidation of fat in the fat cells and promotes faster weight loss even with moderate intensity exercises. Apart from this, broccoli also contains good amount of water which adds volume to you meals without adding empty calories. This Mexican inspired sweet potato salad puts potato salad in a whole new light. The sweet potatoes are roasted to perfection and when combined with black beans, it renders a layer of textures to the salad. The olive oil, lemon juice, honey and mustard dressing gives a sweet and tart taste to the dish while the cayenne adds a touch of spiciness to it. You can use it as a side dish or a filling for wraps and tacos. Skinny Perks – A medium sized sweet potato offers 5 grams of fiber for just 103 calories. The healthy carbs in sweet potatoes increase the level of blood sugar regulating hormone adiponectin that helps to curb the sugar cravings and being a low-glycemic food it stays longer in the digestive tract and helps in controlling appetite. The naturally sweet taste of sweet potatoes helps to satiate your sweet cravings without any sugar overload. This quick and easy couscous salad is the perfect salad for weight loss because it is filling, healthy, low-calorie, delicious and flavorful. What more can you want in a recipe? The smooth and soft texture of the couscous in interspersed with the crunch of fresh celery. The olive gives appetizing Mediterranean aromas to the salad while the lemon juice and spices renders a savory-tangy taste to it without making it too heavy. Skinny Perks – Couscous is a healthy weight loss food with low-calorie and low-fat content. Being loaded with fiber, couscous absorbs water and swells up in the stomach which helps to fill you up more quickly. In addition, couscous is a good source of vegetarian lean protein that promotes the formation of muscles and tissue and replaces the excess fat. Trace mineral manganese found in couscous regulates metabolism and aids faster calorie burning. 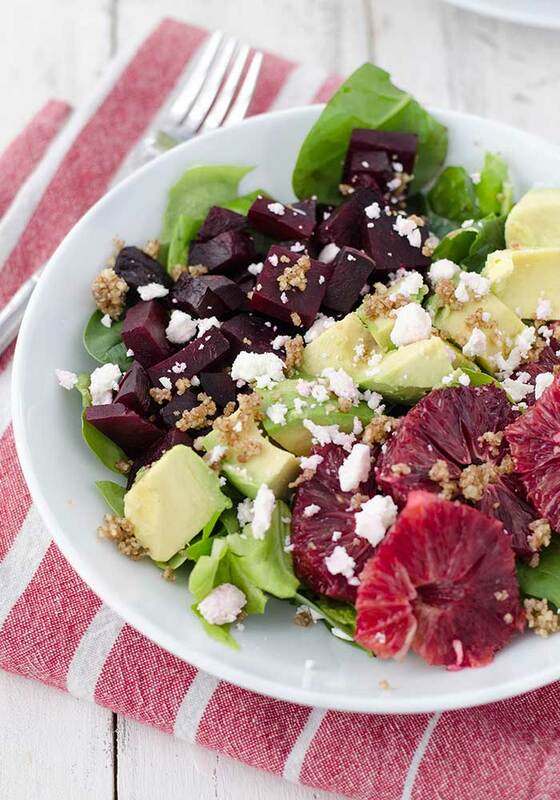 This refreshing and filling blood orange and beet salad is the best way to begin your day and get an instant boost of energy. It is absolutely vegan and gluten-free and packed with complex carbs, fiber and other healthy fats. The roasted beet, spinach, lettuce and avocado combine together to create a layer of chewy, crunchy and creamy textures. The rich and flavorful walnut dressing adds a nutty taste and enhances the flavors of the salad. Skinny Perks – Beets are a good addition to your weight-loss salad because it contains no fat or cholesterol and is a powerhouse of vitamins and minerals. The high fiber content in beet assist weight loss by lowering cholesterol levels. Beet is a low-calorie density vegetable that makes you feel full on fewer calories. Half cup of beet contains only 37 calories. Blood orange is a low-calorie, high-fiber citrus fruit that enhances satiety at the expense of few calories. It also promotes digestion and regularizes bowel movement which also aids weight loss. This healthy, nutritious and wholesome quinoa salad recipe packed with the goodness of mangoes, bell pepper and edamame is a complete meal that supplies all the necessary nutrients to the body. The mango and coconut adds a delightful tropical twist to the salad while the raisins and almonds render a nice chewy and crunchy texture and tart-sweet taste to it which makes it absolutely amazing. Skinny Perks – Quinoa is a low-calorie, high-fiber source of nutrients which makes it the perfect weight loss food. It is a rich source of eight essential amino acids, vitamin B12 and calcium. Vitamin B12 helps in energy production and weight loss through synthesis of nutrients. High fiber and protein content of quinoa makes it satiating so that you can stay fuller for longer. Quinoa is a low-calorie food; one serving of cooked quinoa contains only 172 calories. This simple and easy kale salad is one of the best things you can eat to rest your digestive system and boost up your metabolism after a weekend full of junk food. It is completely vegan and gluten-free which makes it suitable for all. This recipe makes use of minimal ingredients and seasoning which helps to keep it light and yet delicious at the same time. You can enjoy this nice crunchy salad on its own or as a side dish with other foods. Skinny Perks – kale is the super-food for weight loss because is extremely low in calories vegetable and packed with health-benefitting nutrients which makes it a healthy substitution for high-calorie foods. The nutrients calcium and vitamin C found in kale is especially beneficial for weight loss. Vitamin C induces fat oxidation in the body and makes the fat readily available as a source of energy. Calcium regulates bow fat is processed and stored by the body. The more calcium present in a fat cell, the more fat the cell will burn, which will contribute to greater weight loss. 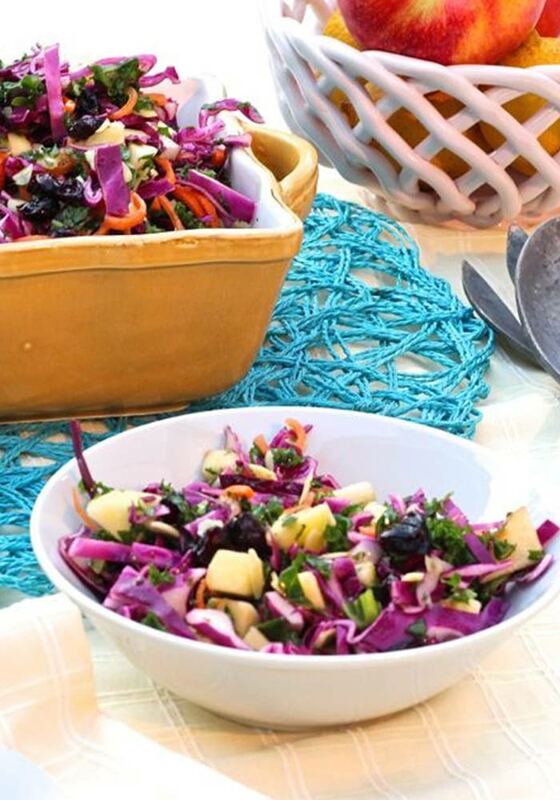 This flavorful and refreshingly delicious kale, cabbage and apple salad will surely brighten up your mood in an instance. The nice crunchy texture of the salad combined with the sweet-tart taste and fruity aromas creates a wonderful side dish that can be enjoyed with lunch or dinner. The tangy apple cider vinaigrette enhances the taste and flavors of the salad and makes it all the more appetizing. Skinny Perks – The soluble fiber pectin found in apples plays an important role in weight loss. It absorbs water and forms a viscous mass in the intestine that slows down digestion and helps you to stay full for longer. Pectin also helps in regulating blood sugar levels and controls the release of insulin. Excessive insulin release is directly linked to increased storage of fat in the body. Indulge in the delicious taste of crunchy celery enhances with creamy walnut vinaigrette. The mellow flavors and rich creamy taste of this salad makes it a perfect side dish that can be enjoyed with a meal. This recipe makes minimal use of spices and oils which helps to keep it delightfully light and simple. The chopped walnuts used in the garnish add a nice nutty taste to it. Skinny Perks – Celery is a versatile vegetable that makes the perfect foundation for salads. Celery is exceptionally low in calories and packed with nutrients such as vitamin K, vitamin A, vitamin B6, folate and potassium. A large stalk of celery contains only 10 calories, 2 grams of total carbs and zero fat. It is a negative calorie food that requires more energy to digest that they add in calories, thereby creating a calorie deficit. The high water and fiber content in celery helps to increase satiety without adding calories. 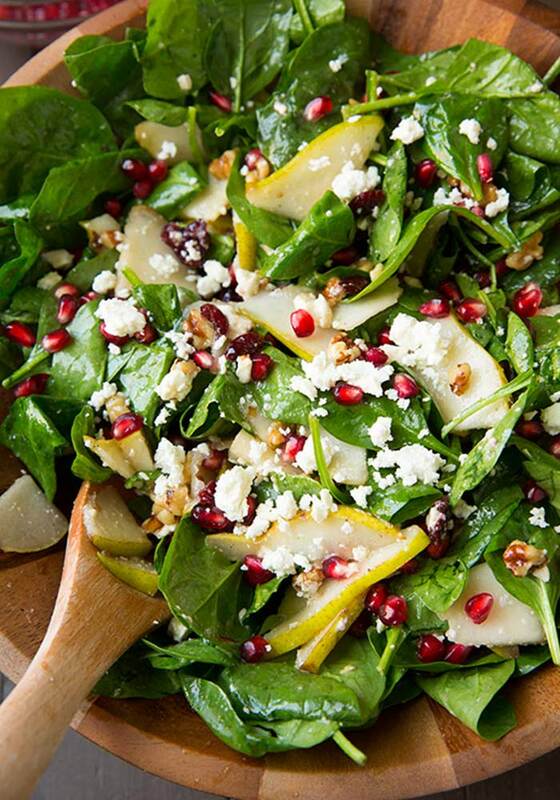 Enjoy the delicious fruity and sweet taste of the pear, pomegranate and spinach salad with feta cheese and indulge in its depth of flavors. This crunchy, sweet and tart salad tastes as good as a dessert. The nutty flavors of walnuts blend with the tanginess of the feta cheese to create something extra-ordinary. The combination of honey, apple cider vinegar and olive oil in the dressing balances out the sweetness and acidity of the salad. Skinny Perks – The green leaf membranes known as thylakoids present in spinach aids weight loss in two ways. It decreases hedonic hunger or the cravings for unhealthy fast foods and sweets and curbs appetite which helps in weight loss. Additionally, spinach is a low-calorie, fiber-rich food that boosts satiety without adding any empty calories. 1 cup of raw spinach contains only 7 calories. Give a healthy and flavorful twist to the classic tomato and cucumber salad with the addition of avocado and a dash of fresh cilantro. It is an absolutely light and low-oil recipe that makes minimal use of spices. The tangy tomatoes, creamy avocado and crunchy cucumber mix together to provide a layer of textures to the salad. The lemon juice and cilantro adds a dash of refreshing flavors to it. Skinny Perks – Avocado is a rich source of healthy mono-unsaturated fats that promote weight loss in several ways. It not only curbs hunger and unhealthy food cravings, but also helps to lower cholesterol and reduce belly fat. The oleic fatty acids prevent body fat distribution around the belly by down regulating the expression of certain fat genes. The healthy fats present in avocado also neutralize free radical damage to mitochondria, which in turn boots the metabolism. So, what are you waiting for? Try out these delicious weight loss salad recipes or let your creativity flow and prepare a low-calorie salad of your own with leafy greens, vegetables, lean proteins, nuts and seeds, a drizzle of healthy natural oils and vinegar and spicy seasoning.